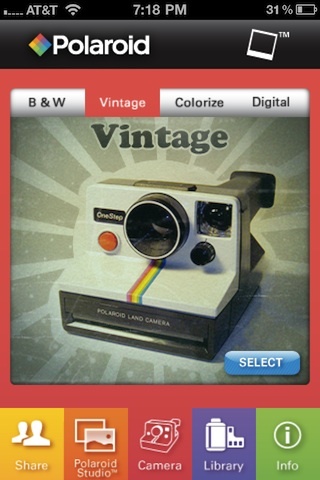 Polaroid Instant Cam is another Polaroid style iPhone app for taking nostalgia inducing photos on your iPhone. The app gives you access to 4 different types of Polaroids including B&W, Vintage, Colorize, and the new Digital version. From there you take a photo, move/scale/crop it by using touch and drag gestures, and develop the film. After the film is ejected from the Polaroid camera you’ll have to either shake the iPhone or blow into the mic to develop the picture (note you can also just wait a little bit). This is a neat feature of this app that makes it fun to use. Then you’re able to add handwritten style text to the white bottom portion of the photo and save/share it via email/Facebook, or just save the final version to your iPhone. The Polaroid Instant Cam also have a service that allows you to upload and store unlimited pictures on the Polaroid Studio servers, and share them with friends that way. This is a nice feature built into the app. Overall Polaroid Instant Cam is a pretty fun photography app for fans of the old school Polaroid look and feel that gives you a few options for different filter and sharing online as well, and not a bad deal for under a dollar. Not to mention that the shake it /blow in it feature is pretty original. Recommended to photography app lovers. AppSafari review of Polaroid Instant Cam was written by Joe Seifi on December 18th, 2010 and categorized under App Store, Photos, Utilities. Page viewed 4778 times, 2 so far today. Need help on using these apps? Please read the Help Page.